Birrificio Italiano’s flagship beer is brewed with all-German hops from the Tettnang area. This Pilsner-style lager is a fine example of the beers from “artisan breweries” that are springing up all over Italy as younger drinkers switch from the grape to the grain. It comes from a brewery near Lake Como in the north of the country, and it promises beers with good malt and hop character in sharp contrast to “industrial beers.” The pils is extremely pale with a toasted malt and perfumey hop aroma. Bitter hops build in the mouth, balanced by juicy malt and a hint of lemon fruit. The finish is quenching, with tart hop resins, a continuing lemon note and sappy malt. 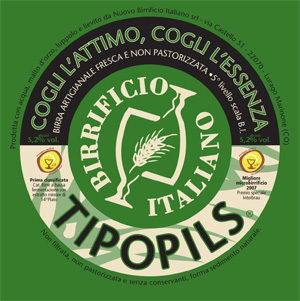 Tipopils is one of the beer sphere’s worst-kept secrets, but finally it is getting the distribution it deserves outside its Italian homeland. Agostino Arioli’s beer offers a modern take on the pilsner style, faithful to the traditional rich malt character and pronounced hop accent but bursting with youthful excitement, as befits a brewery less than 20 years old. Spritzy, peppery hop notes—tangy with herbs and juicy with lemon jelly—burst from the glass as this crisp, fresh, golden nectar somehow manages to pack in an abundance of flavor and yet remain supremely gluggable. A world away from industrial lager.